Friday night tulips, a photo by PhotoPuddle on Flickr. As I mentioned yesterday it's been a bit of a long and exhausting week. So much so I was ready for a bit of a moan on here a couple of days ago. Luckily the Internet was playing silly beggers so I didn't get a chance to bore you all with that. Tonight I am on project chill out. 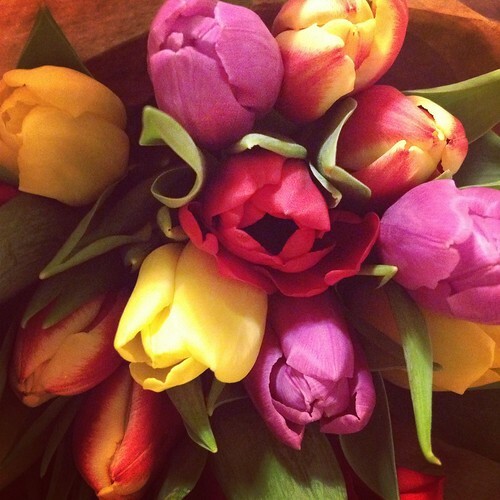 Hubby read yesterday's blog post and brought me home some beautiful tulips (as featured here). We've also had Chinese takeaway, white wine and chocolate. I am now snuggled up under the duvet with a little bit of Internet, my knitting and some Friday night telly. Now if I can just wangle a lie in this weekend I might actually begin to feel more human again.